Ben, Rhodri, Jac and Portia say they feel "lucky" - all four have a bed for the next few nights in a new respite centre. They all need specialised care, and the centre is a chance for their parents and carers to take a break. But the Hafan y Sêr centre in Gwynedd is already oversubscribed - with a waiting list for new places. It has added urgency to a campaign recruiting volunteers for new foster respite care roles in the region. The centre was built as part of the £13m new Hafod Lon special school at Penrhyndeudraeth, near Porthmadog. While the school opened its doors to pupils back in autumn 2016, it was not until last April that Hafan y Sêr was able to take in its first children for respite care. 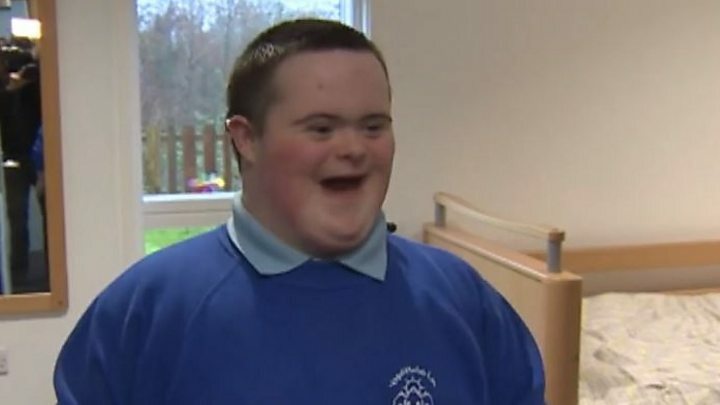 "What makes it special is I get to make a lot of friends," said 17-year-old Rhodri from Llanberis, a pupil at Caernarfon's Pendalar special school. "The staff here are really kind and always helping us." It is a chance for him to be with his best friend Jac, 16, from Penygroes. "The best thing is it is a fun place. We play board games, and watch films," said Jac. The centre caters for children as young as eight - and up to 18-year-old - from Gwynedd and Anglesey. "Parents appreciate the break it gives them," said Alun Gibbard, of Gwynedd council's children and families department. "At the same time I think children are enjoying the time they have in the unit." But with only six beds - he accepts there are other families who could benefit from similar respite breaks. "There are different needs we need to be meeting," he added. "We are looking to attract, hopefully, foster carers who can offer similar opportunities, but in a family setting." The call for new foster carers is part of the overall campaign running across Anglesey and Gwynedd, called Amser Ni - Our Time. There are other volunteer opportunities including helping with shopping and accompanying a family on a day out. But on Thursday, the focus for many of the 43 families who have already made use of the six-bedroom facility was celebrations at the official opening of Hafan y Sêr. As 17-year-old resident Ben simply put it: "This is my happy place."